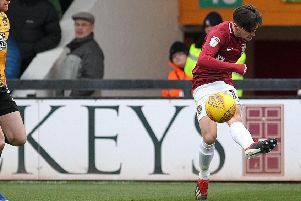 Midfielder Sam Foley has issued a rallying call to his team-mates and the club’s supporters following the Cobblers’ latest defeat at Port Vale on Saturday. Town suffered their third straight defeat as they were beaten 2-0 at Vale Park to stay 20th in Sky Bet League Two, and now face a huge clash against bottom-of-the-table Notts County at the PTS Academy Stadium this weekend. Do you want be remembered as somebody who rolls over and dies? Or are you going to be remembered as somebody who rolls their sleeves up and steps up to the challenge? The Vale match followed a depressingly familiar pattern for Dean Austin’s men, who created and wasted a clutch of clear chances to go ahead in the first half, only to then fall behind and go on to lose, with Aaron Pierre also being sent off for two bookable offences in the second half. The Cobblers have won just one of their opening eight league two matches this season, and have failed to keep a clean sheet in any of their 10 competitive matches. They have also failed to win a home game yet, and that is something that surely has to change against a Magpies team who have claimed just two points out of a possible 24 this season. Foley knows how important the game is, and has called on the club to unite to ensure a positive result this weekend. “It is easy to just give up and throw the towel in, but as a player how do you want to be remembered?,” said Foley in the wake of the loss at Port Vale. “Do you want be remembered as somebody who rolls over and dies? Or are you going to be remembered as somebody who rolls their sleeves up and steps up to the challenge? Looking back on the loss to Vale, Foley was left to bemoan Town wasting some gilt-edged chances, and admitted it is becoming ‘a recurring theme’. Andy Williams and Kevin van Veen both should have netted when the score was 0-0, but didn’t even hit the target with their close-range finishes, and Foley has sympathy for his team-mates. Asked about missing those early chances, Foley said: “It seems to be a recurring theme at the minute, but on the flip side I thought Port Vale played well on Saturday and they deserved to beat us in the end. “But we are getting a lot of chances, and we are not sticking them away. And he added: “Every club I have been at, they have a group of strikers and you don’t them all firing at the same time. “Usually you have a couple chipping in with goals here and there, when somebody has a dry patch, but we are just not getting the rub of the green. “It is frustrating for us, and it must be really frustrating for the strikers.